Everybody loves a comeback. It's always gratifying to see an athlete or musician or actor rebound from a potentially career-threatening injury or drug problems or racist comment and re-emerge to reign triumphant again. Of course, there's also a selfish component to other people's comebacks: On some level, it gives us hope that, hey, maybe we can rebound from that horrible thing in our own lives, too. But regardless of our reasons for enjoying them, high-profile comebacks tend to ooze a cozy sense of nostalgia. We're not so much welcoming back the prodigal son as we are savoring the chance to have one more go-round with an old friend. It's a feel-good story that everybody gets to share in. That's why one of my favorite modern-day comebacks is nothing like what I just described. It was from a maverick filmmaker who had once been great but had more recently fallen out of favor. But when he came back, there wasn't anything coyly sweet about his return. Honestly, he seemed as ornery as ever. I'm thinking of director Robert Altman's The Player, which, good god, is now 20 years old. Premiering as the opening night film of the Cleveland International Film Festival on April 3, 1992—it hit theaters seven days later—The Player was part moral drama, part Hollywood satire. And as Mitchell Zuckoff recounts in his terrific 2009 Robert Altman oral biography, the filmmaker (who had experienced a series of flops in the '80s after great '70s films like M*A*S*H and Nashville) only got to do it because several other directors, including Sidney Lumet, had already walked away from the project. Based on Michael Tolkin's excellent novel, The Player focuses on cold-blooded studio executive Griffin Mill (Tim Robbins at his soulless best), the sort of bottom-line guy who decides what movies get made. He's getting threatening postcards from an anonymous writer, but after he accidentally kills the writer (Vincent D'Onofrio) he thinks is sending them and falls into an affair with the writer's girlfriend (Greta Scacchi), the postcards keep coming. Tolkin's original novel satirized the Hollywood creative community but also spent a good deal of time exploring the tension surrounding Griffin's crime and possible punishment. Altman's film does the same, but like a lot of his movies, you get the sense in The Player that he doesn't really care about the genre—in this case, the suspense thriller. 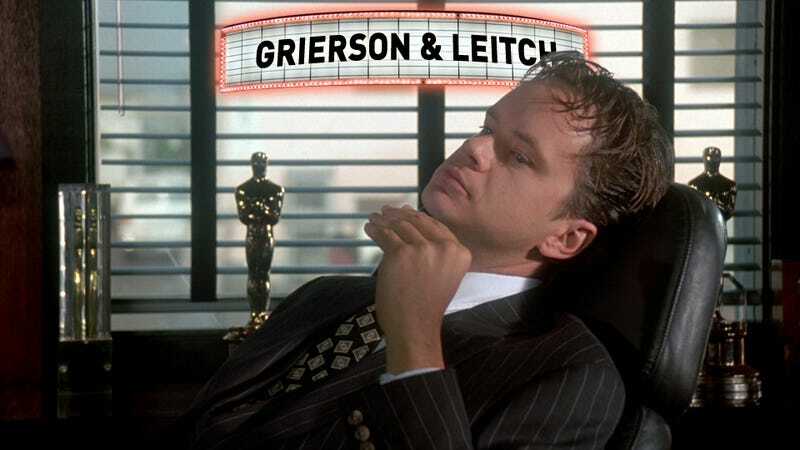 Mostly, the investigation into the killing is an excuse for Altman to study this Griffin fellow and the cutthroat environment of Hollywood moviemaking. If you don't like that, well, read Tolkin's book. And, seriously, you knew this was an Altman film, right? Altman was very pleased with the critical and commercial success of The Player—it helped him make his dream project, the utterly brilliant Short Cuts, a year later—but he really hated how people would call it his comeback. "It used to irk him to death when they'd all say, 'Yeah, Altman's making a comeback,'" his wife, Kathryn Reed Altman, told Zuckoff. "He'd say, 'A comeback? I haven't been anywhere. I've been working.'" And that surliness fills every frame of The Player. There's nothing warm and fuzzy about Altman's putdown of the film industry's incessant bean-counting. He's not lightly teasing them in the hopes they'll notice him. If anything, he seems downright giddy to really let them know what he thinks of 'em. Yeah, it's incredibly showy and self-indulgent, but because it's Altman it works. You laugh at the self-indulgence rather than getting annoyed. And from the opening of The Player, he has you on his side: You feel like you're with him in his pursuit to stick it to the suits who run Hollywood. The Player isn't perfect. (Observers who wanted to label it his comeback sometimes romanticized the film to such a degree that they overlooked its flaws.) The story is a bit wobbly. Whoopi Goldberg's irritatingly irreverent investigator is one of those cases where Altman's improvisational style could have used a little tightening. And, sure, perhaps the ending is a little too self-congratulatory. But even if some of the world that The Player skewers has changed in 20 years, it's funny how much of the film's influence stays with us. While The Simpsons had begun doing the same thing, The Player's use of high-profile actors (like Julia Roberts, Bruce Willis, and Patrick Swayze) playing (and essentially mocking) themselves felt like a revelation, and it would be continued a few months later when The Larry Sanders Show debuted in August of that year. Even more, though, you could argue The Player helped create a new attitude toward Hollywood. It's hardly as if The Player was the first satire of the film biz—Sunset Boulevard is still probably the best of the bunch—but with its through-the-looking-glass mindset, the movie seemed to represent the moment when those in the creative community realized that there was something flattering about being asked to send up their own image. We knew they were stars, and they knew they were stars, so what was the harm in acknowledging how silly fame really is? If The Player presented Hollywood as just another business, it also suggested that we in the audience shouldn't hold it in any sort of esteem. While watching The Player, it's hard not think of Us Weekly's "Just Like Us" section or TMZ's TV show. You can see his 20-year-old film as part of a cultural process of the audience becoming savvier and more cynical about the Hollywood star system. That's why it's funny to think of The Player as a comeback. The folks who were welcoming him back because of this movie were the very ones he was trying to destroy in that very same film.